This lovely apartment has two bedrooms, two bathrooms, a fully equipped kitchen, a dining room , a terrace with beautiful views of the swimming pool and the Mediterranean. This accommodation is fully equipped for up to 4 people. 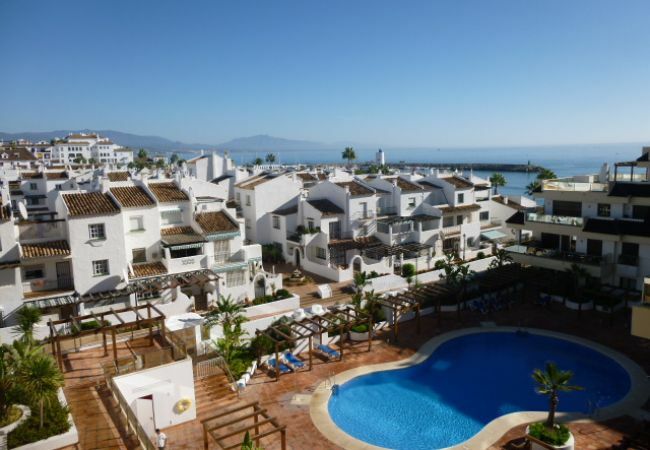 The residence in which it is located, is a few meters from the port of Duquesa , bars and restaurants and supermarkets. It is ideally located for holiday by the sea . - 1 Double bed, 2 Single beds. - 1 Bathroom with bathtub, 1 Bathroom with shower, Hair dryer. - beach, Sea, Swimming pool. - 1 TV, TV Satellite (Languages: Spanish, English, French), Stereo, 3rd floor, lift, garden furniture, 20 m² terrace, iron, safe, internet (Wi-Fi), hair dryer, 85 m² property, 105 m² plot, electric heating, air-conditioned, communal swimming pool, Garage in the same building. Security Deposit (refundable): - Amount: €300.00 /booking. - Payment method: credit card. - With the last payment.